Pre-heat oven to 425°F. Scrub potatoes well and cut each into 8 equal wedges. Place wedges in large mixing bowl. Drizzle potato wedges with olive oil and sprinkle with salt and pepper. Mix well using your hands or a large spoon. Ensure potatoes are well coated. Place seasoned potato wedges onto a baking sheet and bake for 50-60 minutes, turning approximately every 15 minutes. Potatoes are done when they are golden brown. While the potatoes are roasting, combine the Classico® Spicy Tomato and Parmesan Cream Sauce and the chopped bacon in a small sauce pan or microwave safe bowl. Heat to a low simmer, stirring occasionally until sauce is warm. Sauce can be served warm or chilled for up to 2 days. When potato wedges are golden brown and crispy, remove from oven. 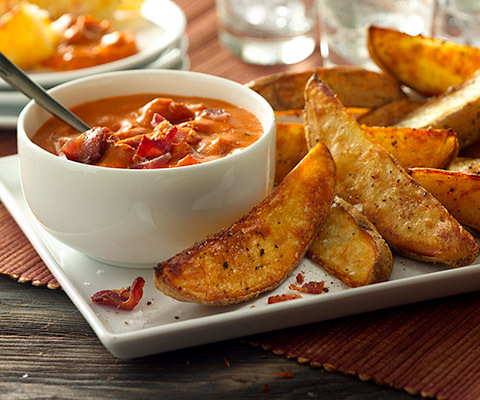 Drizzle fry sauce over wedges or serve as a dipping sauce.